PLOT A mother battles a quartet of burglars to save her children. BOTTOM LINE Union is appealing, but the thriller wastes its potential. The home invasion thriller "Breaking In" seems designed for the "Payback Is a Mother" billboards around Los Angeles in anticipation of Mother’s Day. 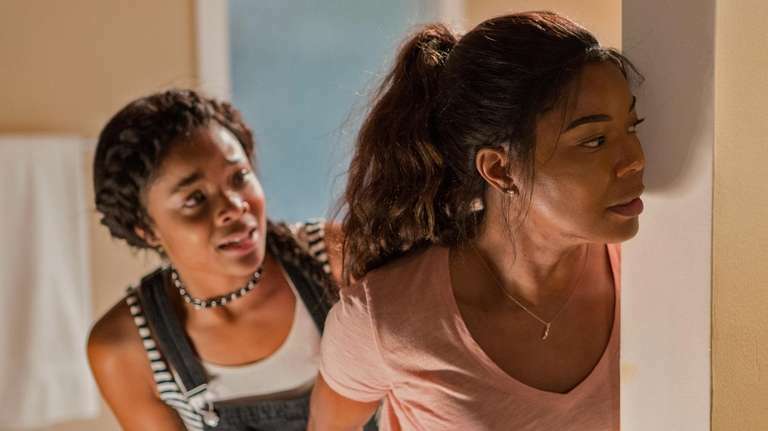 The tale of young mother Shaun (a stern Gabrielle Union) battling a quartet of burglars to save her children is fairly brilliant Mother’s Day programming (or counterprogramming), which is why it’s a shame the movie itself isn’t more fun. Thrillers should be taut and ruthlessly efficient in storytelling. "Breaking In," written by Ryan Engle, directed by James McTeigue, doesn’t have an ounce of fat on it. We’re given only a few minutes of setup before we’re thrown right into it. Shaun and her kids, Jasmine (Ajiona Alexus) and Glover (Seth Carr), arrive at the remote country compound of her recently deceased father. She’d long been estranged from him, and Shaun plans to spend the weekend getting ready to sell the house. They aren’t there for more than a few minutes before four burglars, on the hunt for $4 million in cash they heard her dad kept in a safe, have taken her kids hostage and locked Shaun out. So the riff on the "home invasion" angle is Shaun is the one trying to break into her house to save her children. The film posits Shaun as a supermom who’s always one barefoot step ahead of the opportunistic crew, led by Eddie (Billy Burke), who spends more time psychoanalyzing her than actually getting anything done. As a result, we never believe Shaun is truly in danger. As she hardens her gaze, considering the ways in which they’ve underestimated her, we worry more for the fate of the attackers than we do about Shaun and her children. If anything, you wish for a few moments of silliness to modulate the dynamics of the lean thriller. The dialogue eschews any cleverness or humor, instead stating everything plainly up front. Union gets to deliver a few great burns, but with such grimness that none land with the kind of aplomb to elicit cheers. Union is incredibly appealing, but her performance is one-note, because that’s all she’s given to do. The disappointment of "Breaking In" is the wasted potential — there are a few plot setups that could have been further fleshed out or brought back around (why was her father being investigated by the DA?) and Union isn’t given enough opportunity to truly display her charms. This thriller could have really used some room to breathe.